Canadian Gold Maple Leaf coins are a timeless gift, a smart investment and a mark of true national pride. All modern Canadian Gold Maple Leaf Coins, including the 2014 issue, are guaranteed 9999 fineness. Those issued from 1979-83, however, were only graded to 999. The new 2014 coin has a security feature: A small laser-engraved maple leaf with the number 14 in the middle. 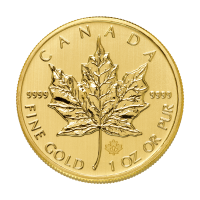 1 oz 2014 Canadian Maple Leaf Gold Coin The Canadian Gold Maple Leaf Coin is one of the purest regular-issue gold coins in the world. It is the official gold coin of Canada and is minted with gold sourced exclusively from Canadian mines. Since its introduction by the Royal Canadian Mint in 1979 this annual series has featured a similar design, although some special issues include colour, privy marks or other flourishes. The globally-familiar Canadian maple leaf emblem is showcased on the reverse of this gold bullion coin and the obverse features the most recent official portrait of Queen Elizabeth II. Canadian Gold Maple Leaf coins are a timeless gift, a smart investment and a mark of true national pride. All modern Canadian Gold Maple Leaf Coins, including the 2014 issue, are guaranteed 9999 fineness. Those issued from 1979-83, however, were only graded to 999. The new 2014 coin has a security feature: A small laser-engraved maple leaf with the number 14 in the middle.